Got to love my Swedish roots! Sweden’s Pirate Party has won a seat in the European Parliament. The group – which campaigned on reformation of copyright and patent law – secured 7.1% of the Swedish vote. 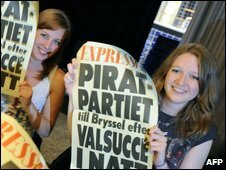 The result puts the Pirate Party in fifth place, behind the Social Democrats, Greens, Liberals and the Moderate Party. Rickard Falkvinge, the party leader, told the BBC the win was “gigantic” and that they were now negotiating with four different EU Parliamentary groups. “Last night, we gained political credibility,” said Mr Falkvinge.